The technique used to create this with multiple stamps is masking. It can be a bit time intensive, depending on how many objects need to overlap. In this case, there wasn't a crazy amount needed to get this done. I created a mask for the tree, bow and gifts stamp since it wasn't needed for the window. I used Inkadinkadoo masking paper for this project. You first stamp the image onto the masking paper, then cut around the image right on the line. If you leave any whitespace outside the line, you will also have gaps when you stamp an overlapping image and no one wants that! At this point you will have a mask covering everything stamped except the gifts stamped on the left side of the tree. Stamped the window (which is not from SSS, I tried to find a similar stamp, but was not having any luck. It would be easy to use a ruler to draw since it's mostly straight lines. I did include a link to a die, which could be used as a substitute in lieu of a stamp. Paper could be die cut to fit to make the frame. Stamp the Santa & reindeer stamp over the window pane area towards the top. 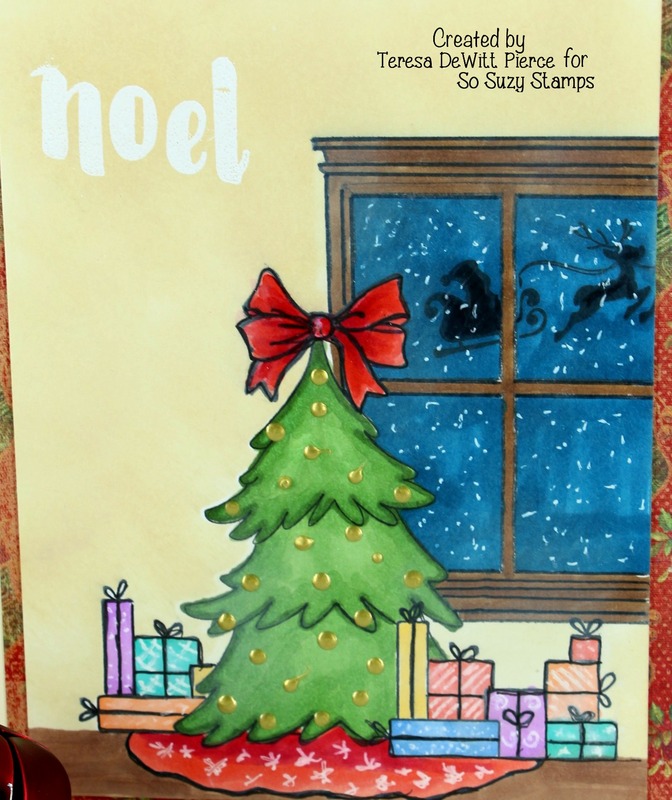 Stamped the Noel stamp at the top upper left side with Versamark, added white embossing powder and heat set so it would resist the ink when I colored the background of the wall. Using alcohol markers, I colored all the gifts, trees, bow, window panes, window frame. With masks still in place, added some post it tape on the edges of the window and blended the color over the non-stamped areas, gradually working in close to the masked areas, being careful not to disturb the masks in the process. I had to move the gift mask to the left when I got to that side. Layered the finished front onto patterned Christmas paper to mat it, then glued both on top of an 5 x 7 card base - which I trimmed down to fit the panel. I usually stick to a standard size card, but in this case I just decided to make it a unique finished size. I hope this inspires you to create a scenic card and if you'd like to use the same stamps (other than the window) the links are below. 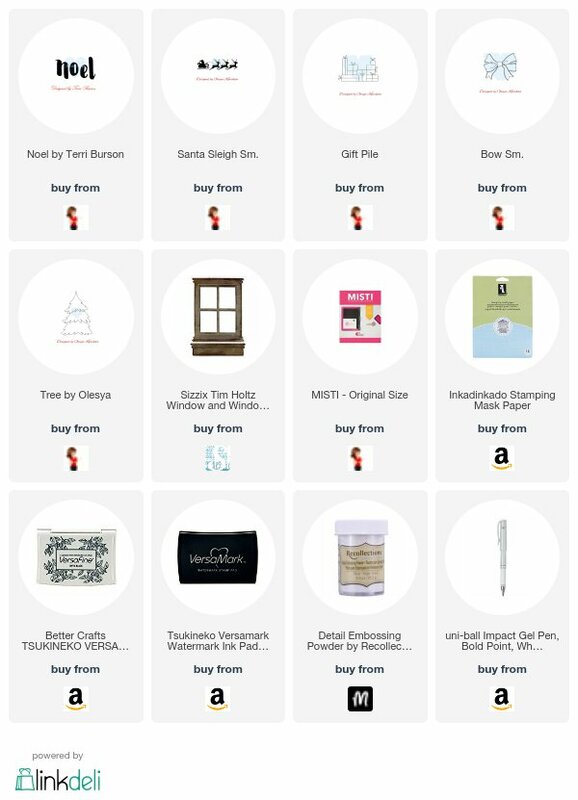 Affiliate links are used for most of the products in this post. What a sweet scene you've created Teresa, a great job on your card. What a wonderful compliment! Thank you so much Teresa!